We are a husband and wife team in the South Suburbs of Chicago, IL, USA that first geocached in May, 2009. We are having a blast and wished to share the fun by creating this signature tag to trade and leave in caches that we place and favorites that we find. Thanks to Design by J and J for their assistance! 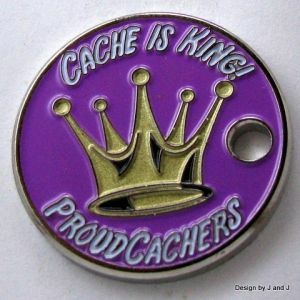 Our tag line - "Cache Is King!" - harkens back to the start of Glenn's previous banking career when he was taught that "Cash Is King." Although cash is not bad, with the wisdom of a couple of years, we now know that adventure and fellowship are the best rewards. If you found our tag, please log your find; and you are welcome to keep the tag. Enjoy!